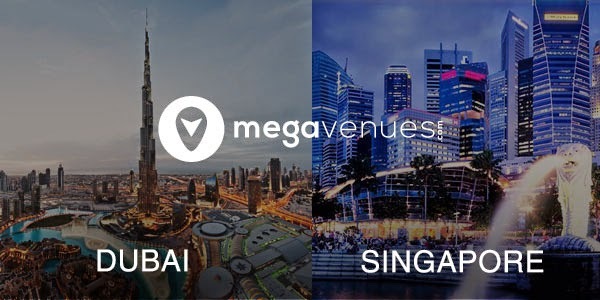 Pune, 14 April, 2015: Megavenues.com, India's largest marketplace for personal and professional event venues has forayed into international markets with the launch of its services in Dubai and Singapore. After establishing its presence across 9 cities in India, this will be Megavenues’ first international launch. The company is keen on expanding its global footprint in 2015 and is also expected to launch in the USA in May 2015. The site has launched its Dubai and Singapore edition with 500 venues each. Speaking about the launch, Rahul Rane, Founder and CEO of Megavenues said, “Being the most popular global destinations for corporate and personal events, Dubai and Singapore is a natural choice to expand our brand internationally. We are really excited about this." Started in September 2013 by Rahul Rane and Shrinivas Chaphalkar, Megavenues today generates event leads worth more than $1.7 Million every week and has 10000+ venues listed on its site. The company's big launch will come in May 2015 when they enter 3 cities in the USA namely Seattle, Las Vegas and Los Angeles. Megavenues is also one of the startups selected to exhibit at the Collision Conference which will take place in May 2015 in Las Vegas. The company expects to utilize their experience in India, Dubai and Singapore for this big launch and to foray into US, which is the biggest events market in the world in terms of dollar value. "We are an open marketplace and provide the easiest and fastest way to discover new venues in any city. Our strong on ground sales teamwhich is woking on establishing partnerships with venues is our key strength and will continue to drive success for Megavenues in the international arena as well." said Shrinivas Chaphalkar, Co-Founder and COO of Megavenues.com. The company recently launched their mobile app for Android phones in the market. Megavenues also recently rolled out their 'Megavenues Boost' product which enables venues to promote their brands and generate higher number of leads from the marketplace. With Boost, businesses are given an exclusive app to accelerate marketing, manage leads and handle CRM operations. "The vision of the brand is to be the strongest global product in the venue space." added Rahul. Over next year, Megavenues is expected to expand to 15+ cities in the US and 8 more cities across India, Middle East and South East Asia. Megavenues is an online and mobile venue search and discovery service which provides in-depth information for 10000+ venues across 3 countries. Megavenues' core content features include authentic info, photos, and geo-coded coordinates for venues; users can rate and review venues, as well as create events and invite guests. For business owners, Megavenues acts as a highly targeted advertising platform, making it convenient for event space owners to interact effectively with customers searching for event venue options. Megavenues was founded by Rahul Rane and Shrinivas Chaphalkar in 2013. The company is present in over 9 cities across India and expanding its global footprint aggressively.